The rain clouds that descended on Trent Bridge on Monday evening denied Derbyshire a first County Championship victory in nearly two years but could not dampen the optimism that came from the best four day performance of the season. To have outplayed the Division Two leaders for most of the game was an achievement in itself and has set the team up for the game against Northamptonshire starting at Wantage Road on Friday. The debut of loan signing Conor McKerr from Surrey provided the attack with the pace that has been absent because of injuries to Hardus Viljoen and Will Davis while there were also significant contributions with the ball from Tom Taylor, Tony Palladino and Jeevan Mendis. 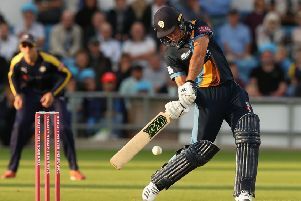 Wayne Madsen returned to form with two half centuries and skipper Billy Godleman led from the front again with his third Championship hundred of the year. But for the captain, it was the consistency of the performance which provided the most satisfaction. “I think everyone played a part, it was a real team effort so it was disappointing the weather intervened and denied us a certain victory,” he said. “We spoke about putting together quality first-class cricket across four days and not just a session or a day so I’m pleased we were able to do that. The 19-year-old McKerr took four wickets in the game and impressed Godleman with his attitude. “For someone so young he’s very astute and clear about what he can do with the ball and he was constantly asking me ‘skipper can I bowl?’ which for me is really refreshing. “With the injuries to Will Davis and Hardus Viljoen we’ve been without a strike bowler for the last month so having Conor in took some of the onus off the other guys who were trying to do that role when their natural skill and ability is to put the ball in a challenging area and build pressure from dot balls. “It was important that we were able to bowl first at Trent Bridge but although the conditions were bowler friendly, we were able to utilise them and that’s something we didn’t do at the start of the season. “We’ve shown progress there and we’ll take a lot of confidence as a group from this game into the one at Northampton.